If you have posted issues/problems with no response, use my thread and I will assist! So, as the title states, I have set this thread up for people who have posted and or created a thread with either no response, or no corrective action. I will help and assist as best as I can with knowledge that I have, I will NOT give an answer if I am not absolutely sure it is the correct one. In which case I will do my best by using search engines, forums ect ect to help. I would also encourage passerbys, if you have the correct answer for whomever is seeking it, please feel free to jump in and help. After all, thats the reason why we are all here is it not? 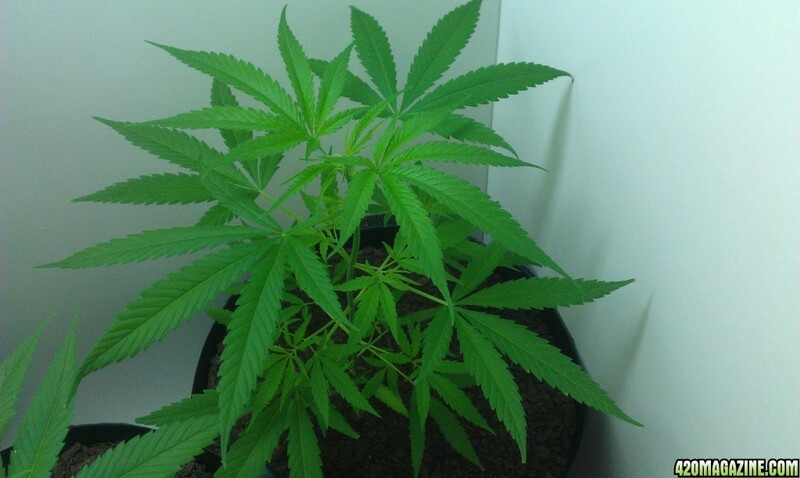 Dont be shy people, I know a ton about growing Cannabis, I can help!! Then again, im sure if you need the help bad enough you will come calling!! I have an issue with white powdery mildew on my medium surface. Nothing bad yet but I believe is messed with my previous crop. just a light about of white. whats the best way to take care of this? Could you please supply a picture of the white powdery substance to better diagnose. Most likely im assuming its white mildew on Rockwool cubes/slabs. If this is the issue then a diluted peroxide spray will kill it. I have a problem with my amnesia seedling. It has started to droop not sure if its overwatered or not. What do you think mate? Aside from the drooping, she looks very healthy. Drooping can be a sign of over watering or under watering, if your medium is dry in this picture, then you are under watering. You basically dont want to waterlog your soil/medium. Water your girls and wait until the top 10% of the soil is dry before watering again. Its hard to tell from the picture but your soil looks dry so I would say under watering. Cheers dude have watered with phed water. Hope that perks her back up. Maybe I can get faster assistance here, thanks for making this thread. 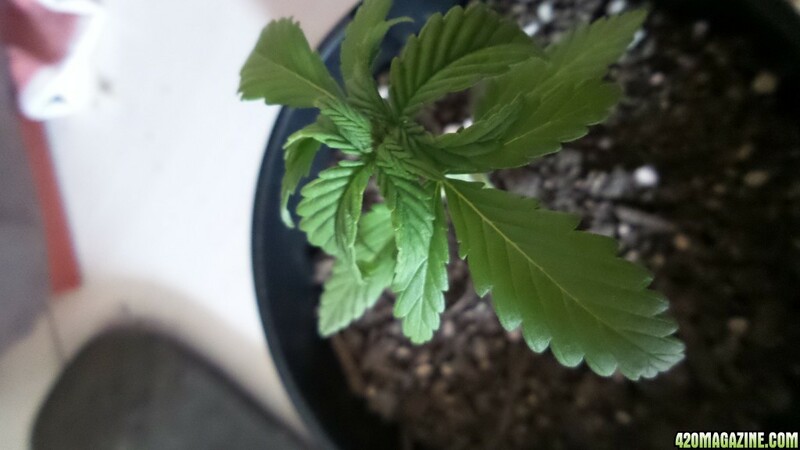 So my 2 plants (unknown strains) are very droopy and my friend says that it's because I'm over watering. How do I know when the water the plants? Their 23 days old, and their not that big and now droopy. I water them about every 2 days until I see a little bit of run off. Not sure when I'll be watering them again though. MG soil is really hot. Just out of the bag it's really, really hot. If you must use MG soil, flush it really well several times before you use it. MG soil has plant food in it. Feeding any additional food is really dangerous. Actually the truth is you can't really flush miracle grow soil at all because the fertilizers in the soil are all time release ferts therefore you could run 100 gallons of water through the soil, it wont help at all. 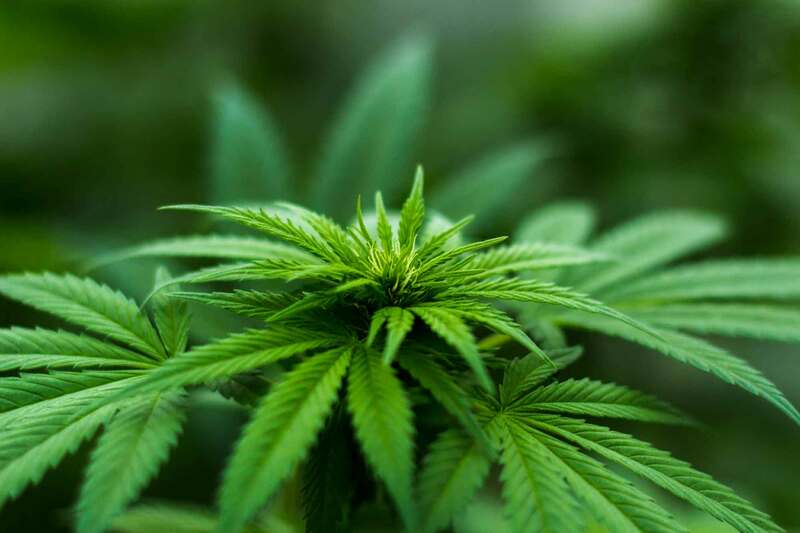 I tell new growers if they can to stay away from miracle grow soil and ferts, it may me good for your beans, or tomatoes, but it is not good for cannabis. miracle grow can be flushed,in a way,with some effort. and you will not get a zero ppm reading,but its under 150 and very workable. miracle grow is what we had in the 80's,Had to figure out a way to get enriched soil to work with us. miracle grow plant food in the proper hands will produce some awesome plants. What type of soil are you using? Yopur plants growth is very stunted, but with the limited information you gave me its very hard for me to understand why. If you could give me all the information you have it would help for example. I would still recommend staying away from MG, it will save you some head aches. Its garbage anyways IMO. If they don't make it that's fine with me because I have more then 15 seeds however I want these plants to make it. I also want to prevent this from happening again for my next attempt. 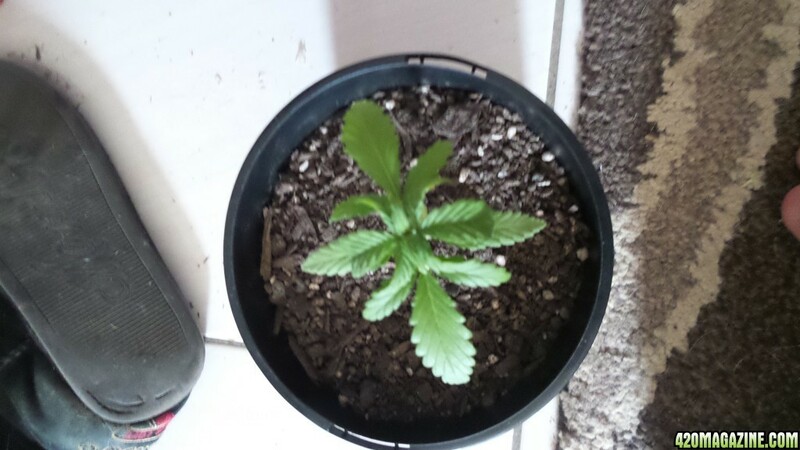 Hello I have three plants in osmacote premium potting mix, using tap water and liquid blood and bone. they are under f24t5 10000x lights. 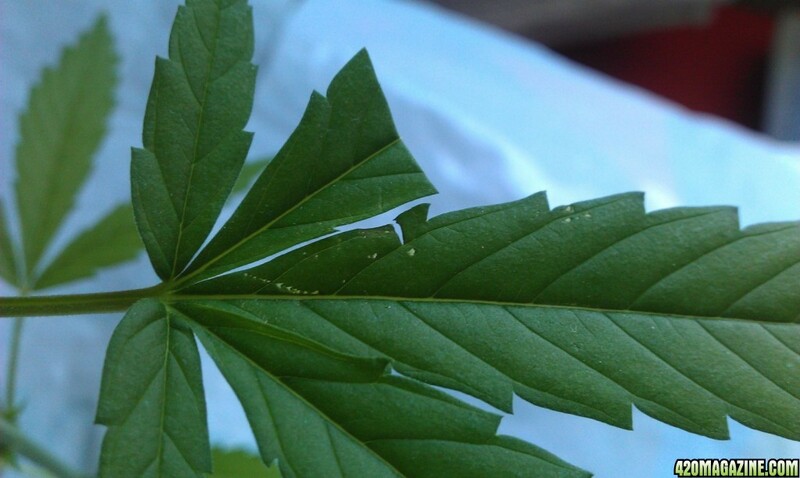 They look great (see pics) i have just noticed one leaf looked like it had been cut through so i trimmed it but the next leaf has also what looks like a cut and a line of tiny holes and other holes. Any help as to what this is would be much appreciated. Please help, I have a plant in a 5 gal pot and its infested with ants. I don't want to use chemicals.